My favorite activity this summer was complaining about the weather. 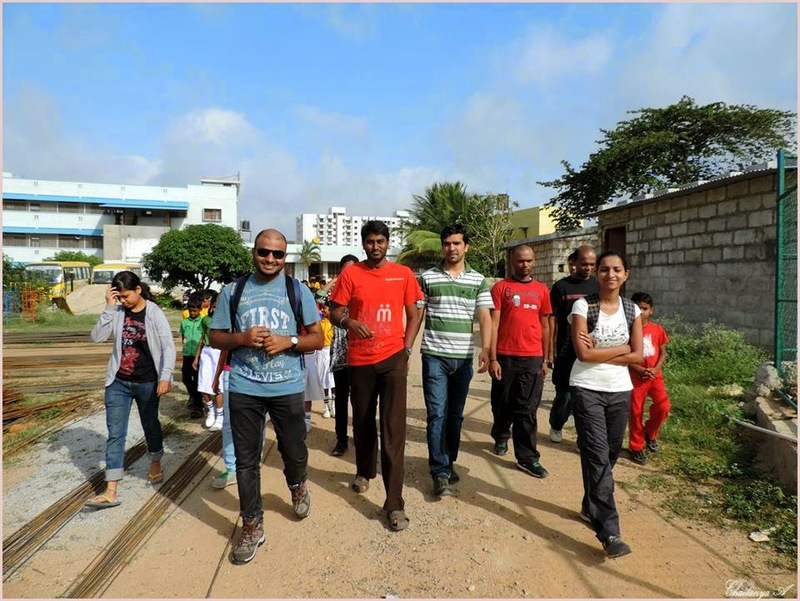 Be it with colleagues during lunch hour, or friends while shopping, or fellow BTCians during a trek, the Bangalore weather remained a hot topic for discussion. We went on and on about how nice it used to be few years back and how stupid people are for cutting trees because of the metro construction in the city. Complaining was easy. It did reduce my frustration for the time being, but it did not have any effect on the weather. Finally, last Saturday BTC gave me an opportunity to actually try to solve the weather problem by planting saplings at a school. And trust me, it was wayyyyy more satisfying than complaining! Saturday, 7:45 am: As always, I could not locate the place i.e. St. Anthony’s School, Begur and Chaitanya (the Organizer of this event) had to come all the way to the nearest bus stop to pick me up. The school campus was huge. More than 500 trees could be easily planted there. However, the agenda of the day was to plant around 100. 8:30 am: I had thought the school would be closed on Saturday. But to my delight, three school buses full of jolly kids in colourful uniform arrived. The boys shouted hi’s and hello’s cheerfully, while the girls waved politely, and when we waved back, they started giggling! 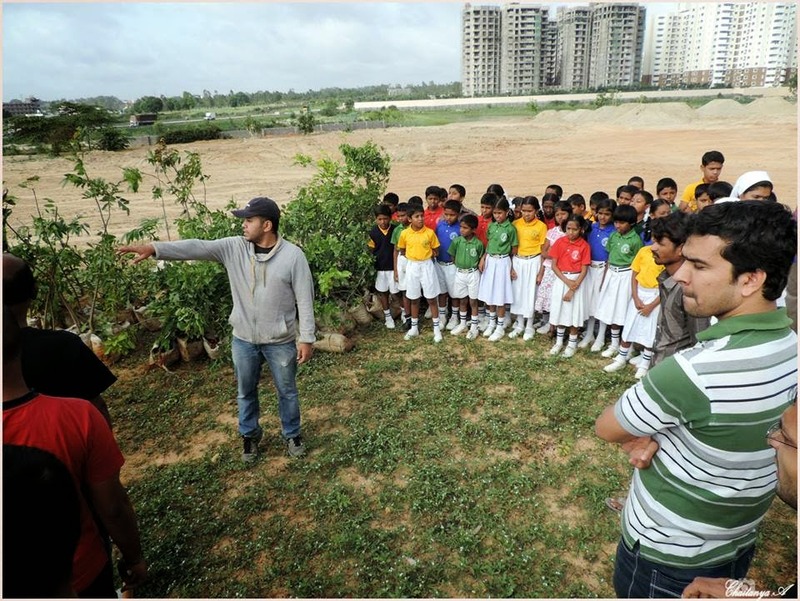 9-ish: We met the founders of ‘Say Trees’, which is a non-profit organization dedicated to saving the environment. 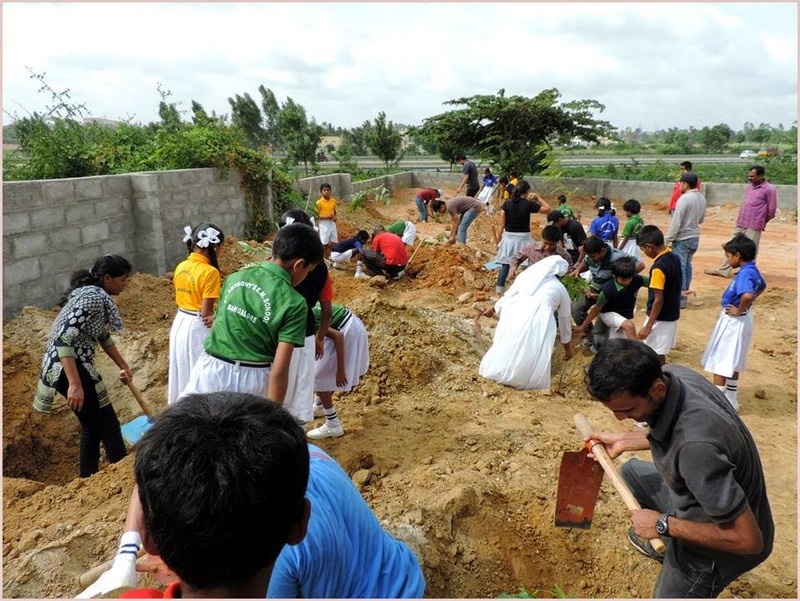 They were responsible for digging the pits, bringing the spades and saplings and also maintaining/watering the plants. They had just started giving us instructions when we heard ‘Good Morning Sirs, Good Morning Ma’ams in chorus!! Around 20-25 kids had volunteered to help us!! Rest of the day: The instructions were simple. Remove the plastic and take the sapling out; place it properly in the middle of the pit; cover it with soil. It sounded really simple and easy. There were different varieties of saplings like Singapore Cherry, Gulmohar and err…I don’t really remember the names. There is a reason why I remember the name of Singapore Cherry, which will come later. So each of us carried a sapling and proceeded towards the pits. While I was walking, a little cutie in blue uniform offered to help me which I readily accepted. Her name was Mala/Moti (I am extremely bad at remembering names). Within seconds another girl joined us. She was Mala/Moti’s best friend and her name started with D (Again, Sorry!). Three of us selected a pit and we were all set for the adventure! I struggled at the first step only. The kids also gave their best with their tiny little hands, but the plastic just won’t come out! Finally a kind soul provided a knife and we managed to take the sapling out. It was fun going inside the pit and placing the sapling in the right place. Then for the first time in my life, I was holding a spade and covering the pit with soil. It felt awesome! I had underestimated the work. It was no walk in the park. The activity requires a lot of upper body strength, which I do not have. Soon my arms started hurting. But then I looked at the Mala/Moti and D. They did not even use spades. With bare hands they were covering the pit! That sight made me ignore the pain and I resumed work, totally inspired by the kids. After probably half an hour (or more) we were done planting our first sapling. It felt so nice to see a fully planted sapling which few minutes back, was wrapped in plastic. As we were walking to get the next one, I got a chance to look at the entire place from a distance. An hour back, the place was so lifeless, with only dozen open pits here and there. Now there stood around 15 baby trees!! I cannot express in words how good it felt. You will understand what I’m talking about once you take part in a Go Green event. In another 45 minutes or so, we were done planting another sapling. By this time I had really bonded with the kids. We had discussed our favorite subjects, the best cartoon shows, and had a small debate on which is better: Regular milk or Milk with horlicks/bournvita. Finally all the pits on the western side were covered, and the Say Trees guys instructed us to move to the other side. Before that, there were two notable events which I must share. First was when I noticed the children gathering around a small tree and plucking something. It turned out to be a Singapore Cherry plant. I was a little hesitant when they asked me to eat the cherries. I did not want to spend the next day locked in the bathroom. But the children were happily throwing the cherries into their mouth. I finally gained courage and had one. And it was yum! tasted similar to grapes. Soon I was happily plucking cherries. The second notable incident was that a snake was found! Apparently there are plenty of snakes in the campus. The girls shared a scary story where a snake was found inside their class room! 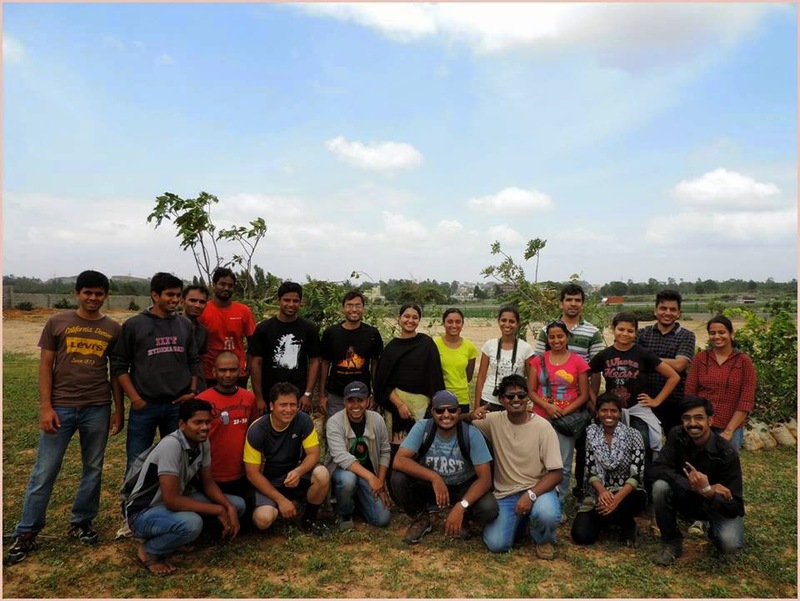 By this time, everybody got the hang of the process and we were planting different varieties of saplings. Even though we were little tired (at least I was), the enthusiasm of the children constantly motivated us and kept us going on and on. 20 BTCians and 20 students of St. Anthony’s were killing it together!! By 12pm we were done for the day and had planted around 92 saplings. Everybody looked exhausted and hungry yet extremely happy and proud of themselves, except the children of course. They showed no signs of tiredness at all. I had casually mentioned to the kids that I could hear my stomach growling because of hunger. I noticed the girls discussed something and one ran away. Guess what, she came back with a sandwich and an oreo! I was so so so touched! After a group photo and introduction/feedback session we finally bid farewell. 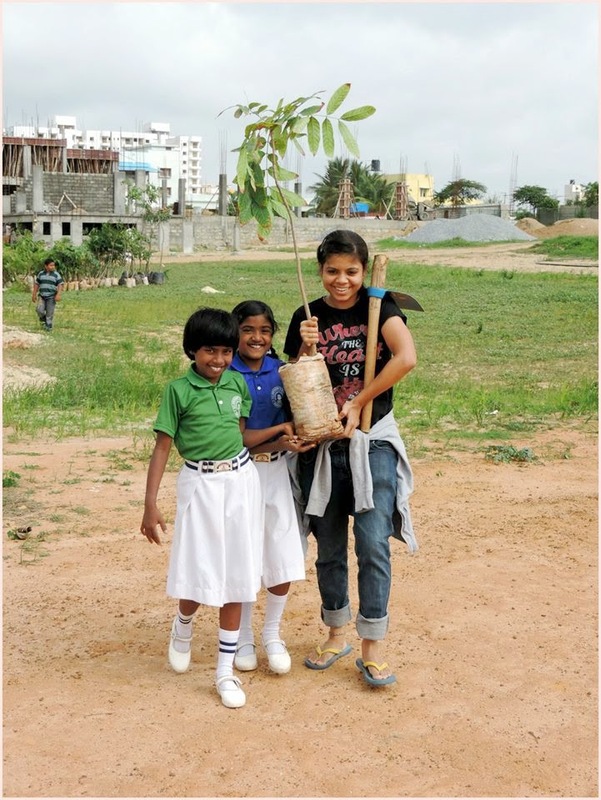 Going to a school, planting saplings, plucking cherries, sharing tiffin with kids…I could not have asked for more.